My God, that's so small! Nice detail work, there..... who needs aftermarket belts?! Pft! In other news,.... it sort of looks like a lil Amish man with with his hands up. Its getting there. I should have picked up the pace on this thing weeks ago as the painting is taking so long and because I am rushing it its looking terrible, well below the standard I usually set myself. Anyway, above is a picture of where it is at the moment. 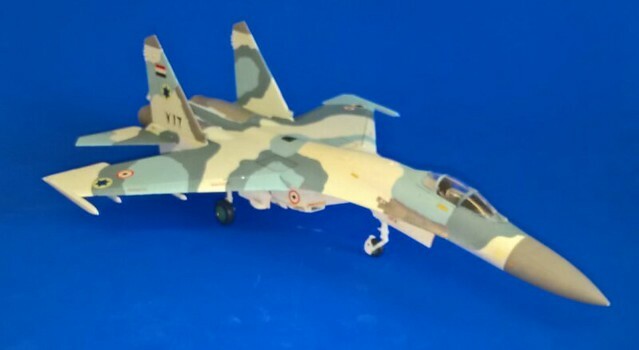 Yes I know that the colours are not 100% correct, the Begemot decal instructions agree with Xtracolor for two of the three colours they list as for the Su-27, the odd one out is the Darkest grey/blue which Xtracolor say is FS 15177 while Begemot say it should be FS 25190. Please disregard the first digit in the FS number as that is for the finish, Gloss is 1, 2 is semi-gloss and 3 is matt. I'm wishing I had thought more about painting parts of this model earlier than I have. The metal areas around the engines are a right pain which I should have painted once I got the fuselage half's together and then masked. Touch up painting is the main thing left on the airframe, tires still need painting and the weapons pylons added. No weapons will be on her as she will be an "on display" aircraft at the IDAF Museum at Hatzerim Airbase. Looks pretty slick to me(literally and figuratively)! I like it. Getting close to the "fun" part of putting on all the transfers. The majority of decals are on as are the parts. 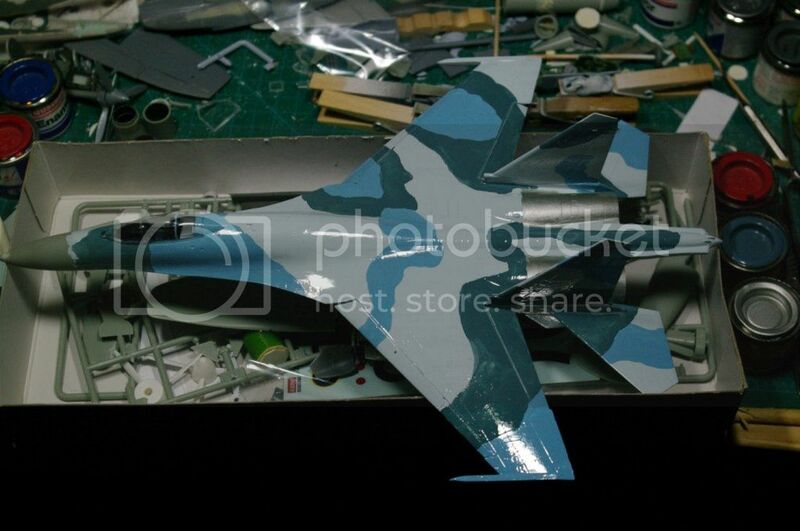 No Israeli decals on at the moment as I done have the right size for the ones that will have to go on the air intakes. The Israelis use certain fixed sizes only and I only have one size which is used on the majority of their combat aircraft. What I have will do the wings but not the intakes, might shove a couple of roundels on the tail fin instead but for now the aircraft will be as it arrived in Israel on the defection on the pilot. May as well! If you're like me, you have the "well, if I do it to one, I should to it to them all" mentality.. like working on cars. If I put a new brake kit on the rear passenger side.. well, whether it REALLY needs it or not, I'm going to do it to the other side as well. Sounds kind of like me and my gun barrels... I've broken off all but like... 3 of them. May as well snap them off, too, and glue them all back later at the same time. In fact, I've heard before of a guy that, first thing, he snaps off all the molded on antennas and gun barrels, etc, before he even starts, only to put them back on later, dead last. I'm going to start doing that. I've never been able to keep that stuff on for long. In a similar vein i'm a firm believer in pre-emptive soiling. New couch? New carpet? Chuck a glass of red wine on it as soon as you can. It gets it over and done with and enables you to stop worrying and relax. 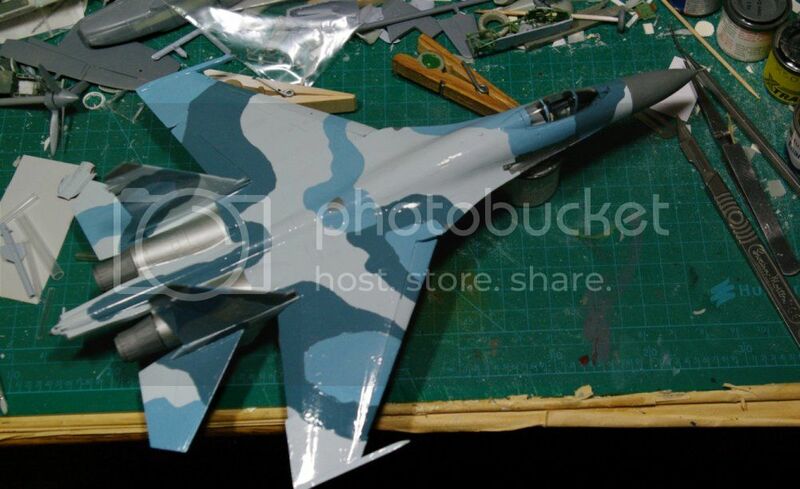 Re: זְרוֹעַ הָאֲוִיר וְהֶחָלָל Su-27SK Finished!!! 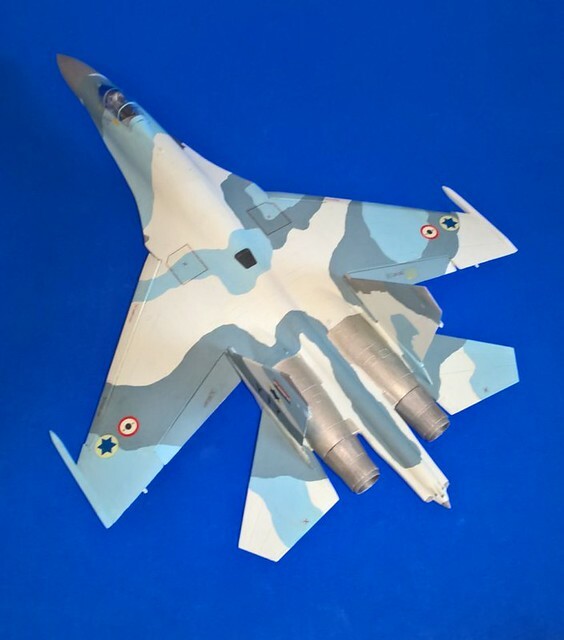 The זְרוֹעַ הָאֲוִיר וְהֶחָלָל or Israeli Air Force came into possession of it's Su-27SK, formerly 716 of the القوات الجوية العربية السورية or Syrian Arab Air Force, in 2002 when it's defecting pilot flew the recently arrived aircraft to Israel. Nothing was known about the defection from either Syrian or Israeli sources with the Syrian's not wanting to lose any credibility over the defection and Israel wanting to keep the prize to themselves or to use as a bargaining chip with the USA. After a couple of years the aircraft was displayed at Hetzerim Airbase with other captured/defected aircraft. 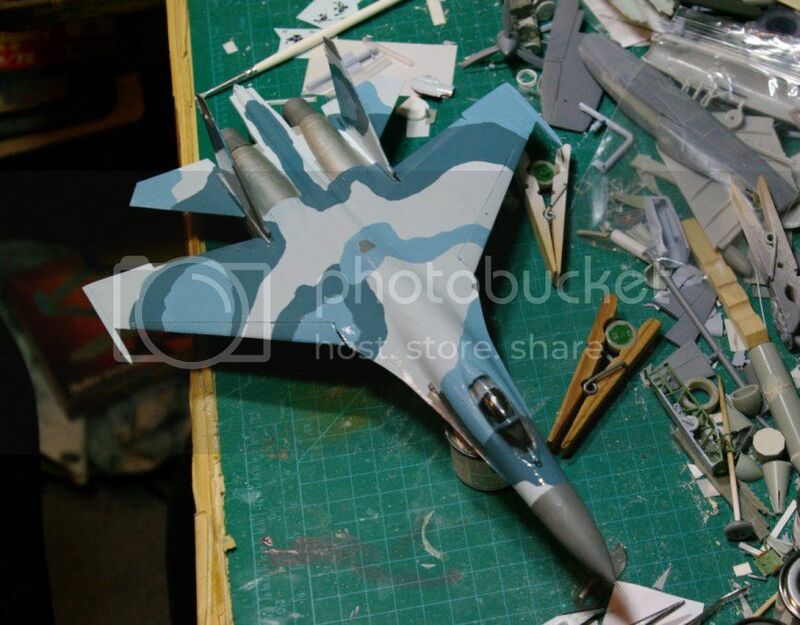 The model is the rather old Airfix kit which was in the stash. I droped the flaps and slats as the trenches depicted in the kit were horrible and this was a way to disguise them. Paint was mainly Xtracolor with a few colours by Humbrol. Decals were a mix of the kit's decals, stencils, and Begemot 72-025. 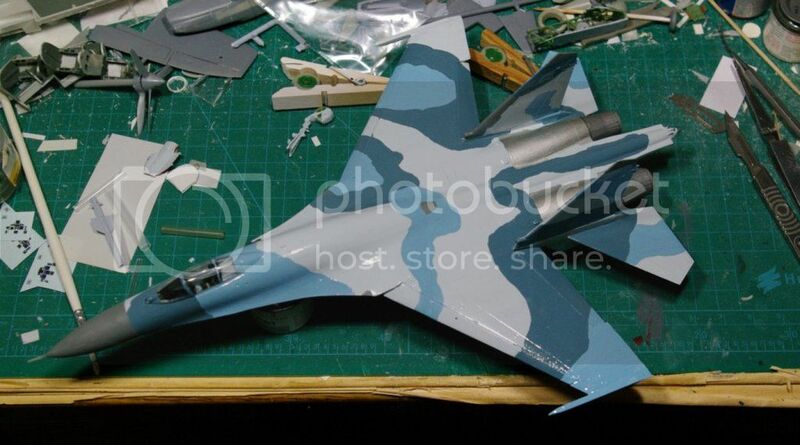 The Arabic numbers are from a Fujimi MiG-21 kit and the Star of David came from a Hasegawa Kfir decal sheet. 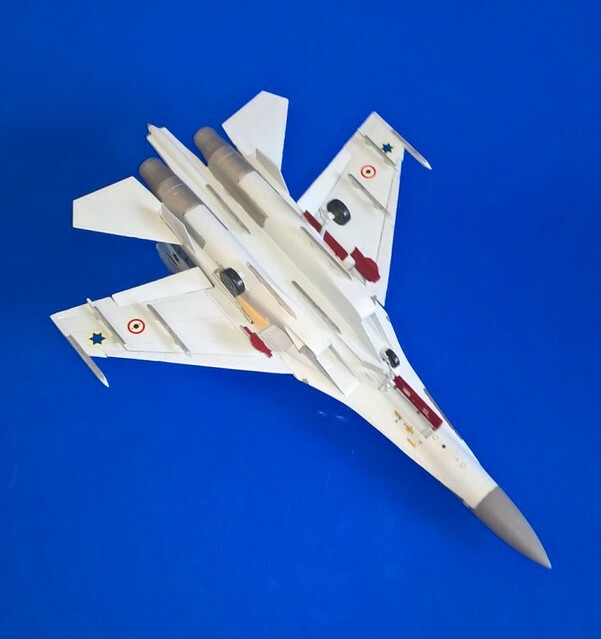 The idea for the build was based on the Begemot decals which included markings for a Syrian Air Force machine, they actually trialled a pair of aircraft back in 2000 but never proceed with ordering any, going with the MiG-29 instead. 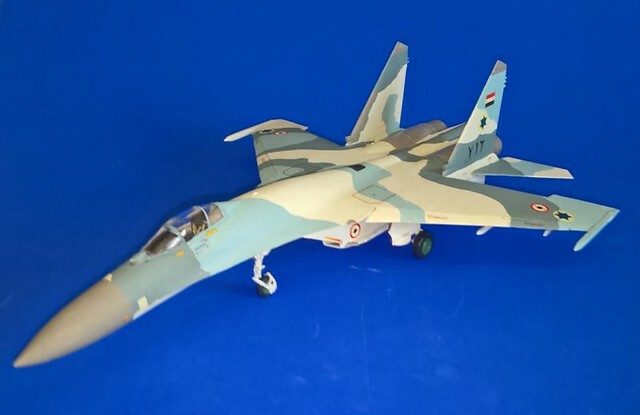 I simply went with them buying and operating a couple of squadrons of Su-27's and then having one of the pilots defecting to Israel just as a former Syrian pilot did with a MiG-23. 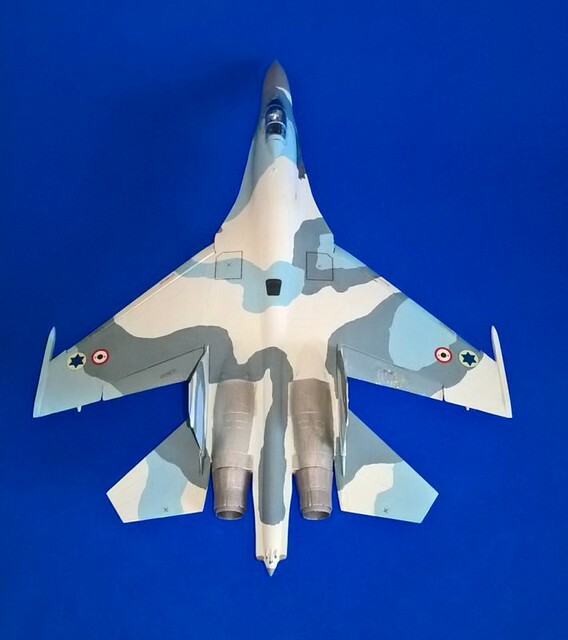 I tried to follow the system or marking that the Israelis did with the MiG-23 but found that applying a Star of David next to the roundel on the intake side was not very practical so I placed it on the side of the fin which had a lot more space.